This week, we keep it simple on Every Food Fits. It’s summer here in the Mid-Atlantic, so all we can think about is grilling and creating simple meals fast. And that means one thing for us: HOT DOGS. Boiled on the stove or cooked on the grill, hot dogs are a great source of protein. Sam suggests opting for reduced fat and reduced sodium versions when available. Do read labels carefully and be a smart shopper if sodium in particular is a concern. The chicken or turkey hot dogs may provide a calorie and fat savings, but are often higher in sodium than all beef varieties. This varies greatly by brand, so do your label reading homework. 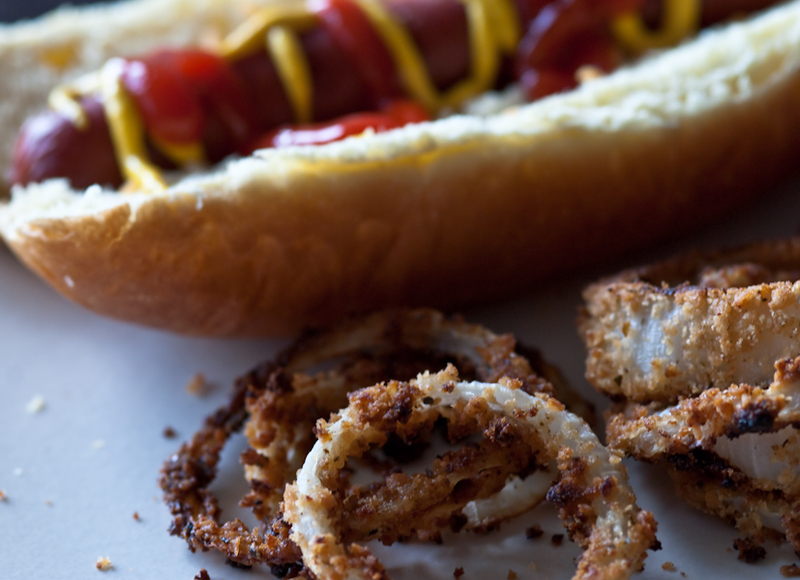 Cooking a hot dog is terribly simple – just ask our husbands! Boil a pot of water, dunk the uncooked hot dogs, cover and let them sit for 7 minutes until cooked. Or place them on the grill and cook them until you see the thin seam on its side split open. But what’s a hot dog without a side? One of our favorite sides is oven fries. Take a sweet or a Russet potato, scrub the skin and cut it into strips. Place the strips in a big bowl and make a light drizzle of extra virgin olive oil (or other vegetable oil) and sprinkle with kosher salt. Lay them out on a baking sheet covered with foil and coated with a little bit of cooking spray. A non-stick silicone mat also does the trick. Place the sheet on the middle rack in the oven. Bake at 375 for about 15 minutes, then turn on the broiler and cook another 5 minutes or so, until they’re browned to your liking. You can also try baked onion rings. Stacey varied the ingredients in this Everyday Food recipe, and switched the cornflakes for canned French fried onion rings. They were tasty! What’s your favorite side during the summer? Do you use store-bought or homemade buns? Inquiring minds would like to know your tricks in the kitchen! How Stacey Got the Shot: Soft evening light coming through the window, 105mm focal length, f/5 in 1/40th of a second. She also took some photos with expired film and likes the result. What do you think?